Common Challenges of Recurring Billing | BMT Micro, Inc.
Consumer buying habits are continuing to move more toward convenient shopping experiences. This is one of the many reasons why recurring billing (also known as the subscription business model) has become one of the most powerful strategies in digital commerce. But, the management of recurring billing can be quite complex and there are a few key challenges businesses may encounter from time to time. At some point, customer payment details are going to change. Credit cards expire every three years and get canceled for numerous reasons. This makes recurring billing more vulnerable to some sort of hiccup eventually happening to almost every payment detail “on file.” Whether a card has expired or has insufficient funds, you will need a solution to highlight when transactions have not been processed and notify customers of failure. A good strategy for recurring billing is to offer multiple pricing plans based on different features and levels of service. This offers more affordability or choice to a wide range of users with diverse needs. However, this can also be difficult for businesses to manage. You will need a recurring billing solution that can help make necessary pricing changes with ease. The solution should also be able to manage recurring payments on a monthly basis, quarterly, semi-annually, annually or as required by the business. It is unwise for businesses selling internationally to limit customers to only one payment option and language. This can reduce the chance of completing a sale and increase cart abandonment rate. Customers prefer to shop in their native language, and it is crucial to display prices in their local currency. But, doing this can cause numerous problems with billing customers. You can display pricing in each respective country’s currency and convert the currency to their own or set up an account to accept the country’s currency. You also need to be able to adjust quickly for varying exchange rates and adhere to international taxes, tariffs, and fees. Not everyone is comfortable with sharing their sensitive information online every time they make a purchase. A secure connection should always be available between the customer’s browser and a business’s web server. This best way to ensure customer’s information stays secure is by using a recurring billing solution that is PCI compliant. PCI regulations apply to all organizations or merchants, regardless of size or number of transactions, that accept, transmit or store any cardholder data. Additionally, a quarterly scan by an approved scanning vendor is required if cardholder information is electronically stored or processing systems have any Internet connectivity. Important Note: If you are a vendor of BMT Micro, you are PCI compliant by default using our secure system and there is no need for you to acquire your own PCI Compliance certificate. We have also partnered with SecurityMetrics, who perform quarterly reviews and ensure we maintain PCI compliance and up-to-date data confidentiality standards. Eventually, customers will want to make changes (upgrades, downgrades, etc.) to their subscription. Some customers will also expect a business to be able to offer them credits or refunds if something goes wrong. You should look for a recurring billing solution that supports account modifications and works to minimize any chances of chargebacks. It should also provide an effective way to categorize customers in terms of sign-ups, trials, activations, upgrades, and downgrades. 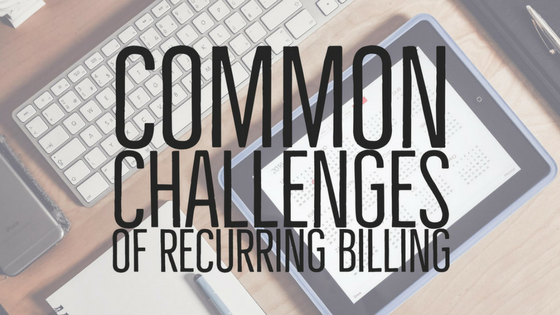 Using an effective recurring billing solution is one of the only ways businesses can overcome these challenges. But, it is important to do thorough research beforehand to determine what your business will need. There are a variety of solutions and e-commerce providers to choose from, so find one that meets all of your business needs. BMT Micro has all the tools you need to run a successful subscription business model and overcome these common challenges. We will take care of rebilling customers when necessary so you can concentrate on other aspects of growing your business. If you would like to learn more about our services or if you have questions, please feel free to contact our vendor services via email at vendors@bmtmicro.com or visit our website at www.bmtmicro.com.